You can find plenty of free mockups online, but most cater to Photoshop users. In recent years Sketch has grown rapidly with tons of plugins and free tutorials to help beginners move into this alternative UI design software. This also means you’ll find tons of awesome Sketch freebies online ranging from complete mockups to detailed UI kits. 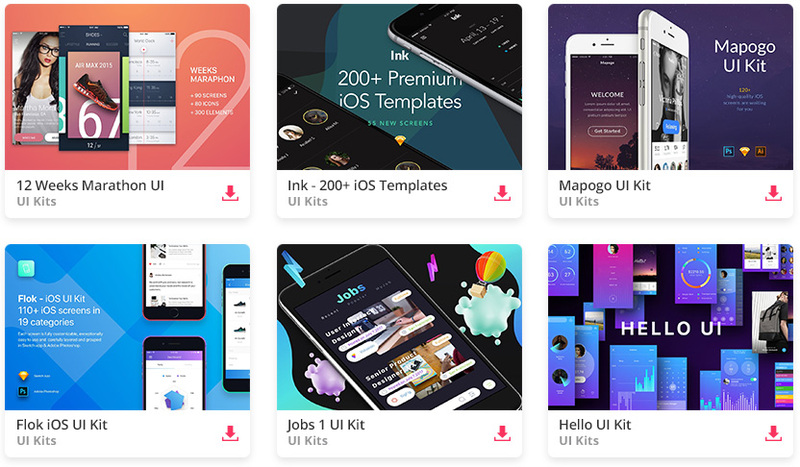 And in this post, I’ve curated my top 10 picks for the best freebie UI kits for any Sketch user. Every new release of iOS prompts an updated GUI kit and this freebie is by far the most comprehensive one to date. It covers all the major elements for iPhone and iPad apps with free kits for most design software. You’ll find PSDs for Photoshop too, but you can download just the Sketch files with the same iOS-styled vector elements. These elements all come in @1x size, but since they’re vectors you can easily resize them without any quality loss. One of Google’s lesser-known projects is the Google Now prediction app. Designer Manu Akash created a variation of the Google Now UI as a Sketch freebie. This kit features a lot of the main application pages but also uses styles from the material design library. It’s a great freebie to keep saved if you want to design Android apps while following Google’s design styles. Free blogging platforms like Medium have changed the face of writing on the web. And this free blog UI kit shows what’s possible with a great mobile application UI following that same tactic. 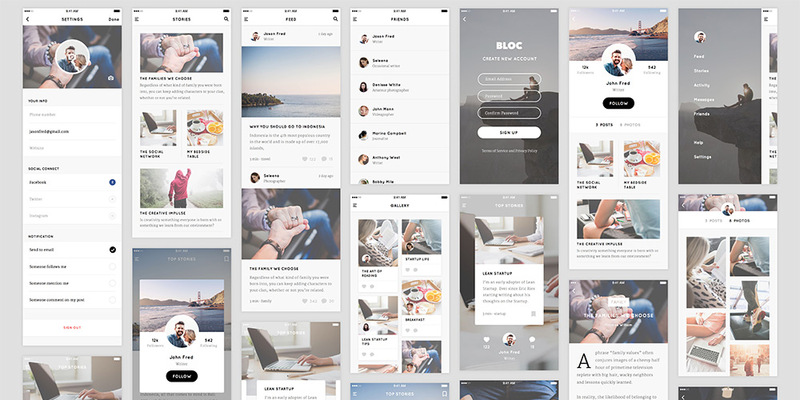 Designer Thomas Budiman created this blog/writing kit for Sketch with a focus on mobile app design. It spans many different types of interfaces like gallery pages, article archives, and signup/login forms for new users. 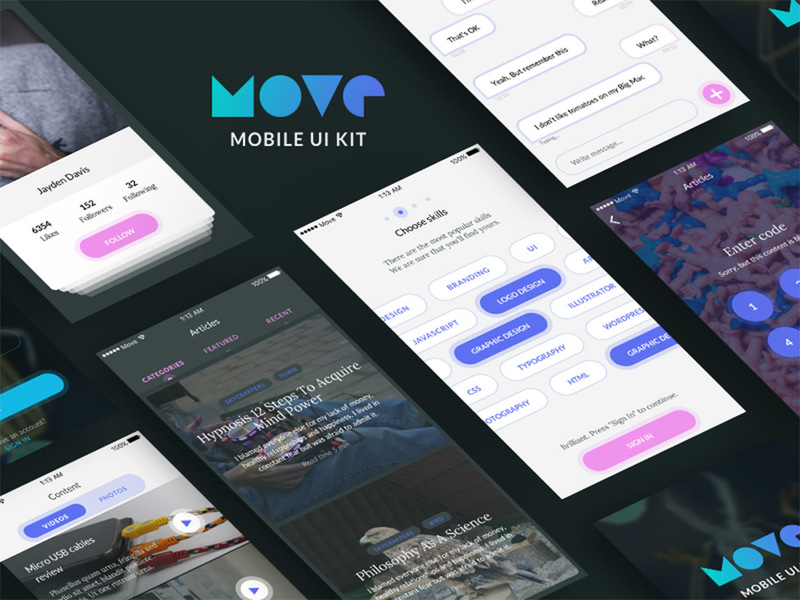 Move UI is a free mobile app mockup pack created by Czech designer Volodymyr Kurbatov. This pack doesn’t focus specifically on elements, but rather on screen designs and interfaces for different situations. But in these interfaces you’ll find all the common mobile elements like buttons, input fields, tabs, post archives, slideshows, and pretty much everything else you might use for a custom mobile application. This freebie is hosted on Gumroad so it works through their checkout system, but notice it’s a whopping $0, so it won’t cost you anything to download. For a very unique eCommerce-style UI kit check out this coffee shop freebie designed in Sketch. It mimics an iOS application for a local coffee shop with over 50 screens covering the shop menu, checkout, and product pages(among many others). The coolest thing about this freebie is the ease of use. You can take this design and customize it however you want to create any type of mobile eCommerce interface. Each element is a scalable vector and the text is all based on free Google Webfonts. Social media is a huge part of today’s web and this freebie offers a really cool start for mobile designers. The interface kit comes with a handful of screens showcasing a social marketing application. The screens feature user lists, login fields, profile pages, and photo upload/edit screens for interactivity. Many of these elements can be expanded to a full website layout so don’t feel constrained to a mobile design. 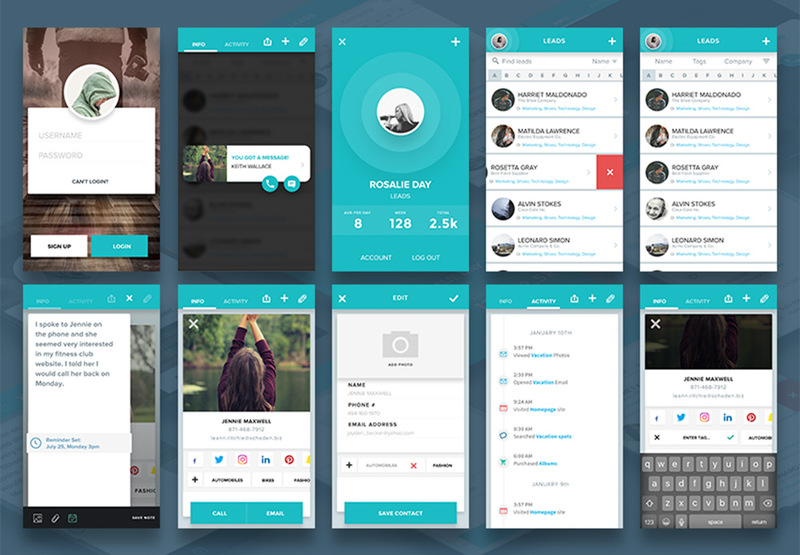 This UI kit also follows the material design language so it’s best suited for Android or Google-type interfaces. The Bootstrap library is hugely popular amongst designers and it’s the fastest way to get a new project online. You can always start by coding the layout first, but it’s usually easier to work with a mockup like this BS3 UI kit. This is totally free to download in both AI and Sketch format. Each element perfectly matches with the Bootstrap 3 kit, and it uses Glyphicons, just like Bootstrap. If you’re designing with Bootstrap, then you’ll absolutely want a copy of this freebie. And if you’re eager to move into Bootstrap 4 then check out this Sketch freebie of the BS4 grid system. It’s not a complete BS4 kit since that version is still in Alpha release, but hopefully we’ll see more of those freebies in the next couple years. This mobile map UI kit features all the pin drops, location arrows, and search features you’d expect from a geolocation app. The Harmony UI Kit by Dawid Młynarz is one of the newer Sketch freebies on this list first being released in mid-2017. It comes with a dozen mobile app screens of map interfaces and search features for finding directions on a phone. The UI kit is totally free but it’s also hosted on Gumroad so the download process can feel a little weird. Here’s another niche mobile UI kit based on the Tinder interface. This freebie was created by Gilberto De La Garza and released for free on Sketch App Sources. It comes packed with 15 different views for profiles, user lists, dating info, and photo pages. This interface kit mimics the Tinder application, but you can pick out smaller elements from this UI kit and use them on your own. Sketch is perfect for iOS app design because it lets you resize elements without any quality loss. That’s why kits like this Tinder freebie are so valuable for newer designers just learning the ropes of UI work. Digital wireframing is a huge part of any interface project. The process of wireframing and even prototyping helps you map the interface with clarity before designing the colors, textures, and typography. 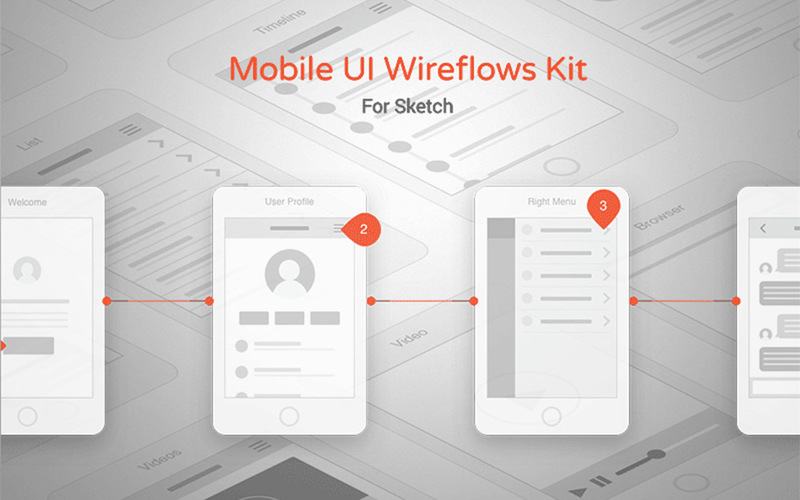 This mobile wireframe freebie is an excellent place to start. It’s built specifically for Sketch and comes with 57 different mobile interface screens you can pair together. All of these screens include vector elements that you can also arrange to your liking. A really fantastic UI kit for pre-design work and basic prototyping.